The following are detailed specifications about the 60-Watt A19 Silver Bowl Light Bulb. 60-watt A19 incandescent bulb with silver crown finish and medium brass base. Average rated life of 1500 hours. 130 volts. Hard to find special bulbs! Was so happy to find these specialty bulbs at a great price. Previously, could only find them by the case load, but the bulbs last so long, I feared they'd outlast me! I used it in the study. It is not what I expected but I do love it. It is an attractive bulb.No negatives for me. It works and looks great. 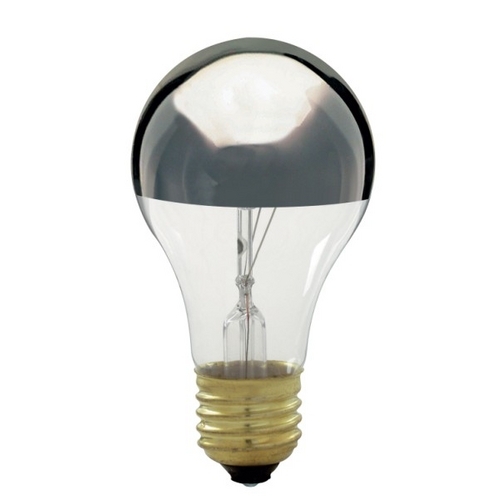 This 60-Watt A19 Silver Bowl Light Bulb is part of the $item.xCollectionName Collection from Satco Lighting. The following items are also part of the $item.xCollectionName Collection.